Review: How do you stop ghosts from killing? After a series a gruesome murders strikes a small river town Sheriff Logan (Angle) notices a similarity. After his investigation points to three brothers that are dead things start to get weird. 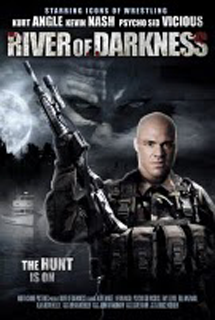 For starters the main stars of the movie are three wrestlers : Kurt Angle, Kevin Nash and Psycho Sid Vicious. When these are you main stars you really can't expect a lot from the movie. The plot, acting and apparent budget reminded me of a "Scy Fy" channel original movie...only worse. The acting is really, really bad. The movie itself could have been worse I guess, but the acting was so bad it's distracting. Overall this was better then I expected, but the acting was SO BAD it's hard to overlook. Movie is a C-, acting is F. When taking both into account, I say D+.